We had a nice quiet weekend. I got another batch of jam made, which may have turned out better than the first! I had guild meeting last night. It was so nice to see my quilty friends and even make some new ones! And before I even got to my guild meeting a friend called me about a job! How exciting is that! Don't know the particulars yet so keep your fingers crossed! The sad news is I did miss Glee last night, but don't you worry I'll be sure to watch it online sometime today! 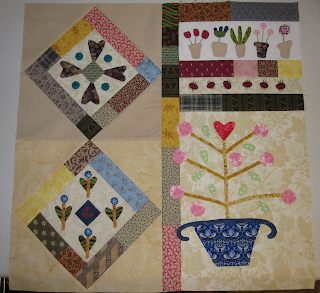 Well this is my 6th block done for the "In my Garden" quilt. Just 3 more to go and I only have to prep 5 pieces to complete all the prep work!! I'm currently watching Season 3 of Fringe so I'll get lots of stitching done during that. I'm planning a trip down to Baroda, MI to visit my Aunt and go to a big craft fair at their local fair grounds on Saturday. I'll let you know if I find anything I can't live without!